In our first blog post in this Post-Conflict Colombia & Public Health project series, we shared our hopes for a brighter future in 2016. While the year has indeed been a tumultuous one, in some parts of the world there have been bright spots. Just weeks ago, the Colombian Congress approved a revised peace accord between the Government and the Revolutionary Armed Forces of Colombia, formally ending more than 50 years of armed conflict and earning Colombian President, Juan Manuel Santos, the Nobel Peace Prize. For the more than six million Colombians who have been working to rebuild their lives since being forcibly displaced, the peace deal adds momentum to their efforts in securing greater recognition and realization of basic rights, such as access to healthcare and education services, infrastructure such as roads and sanitation systems, and the rights to the land they live on. Beyond the two leading negotiating parties, the voice of Colombia's internally displaced is one that can no longer be ignored. A stronger and more prosperous Colombia calls for addressing the grievances of those forced from their homes and locked out of Colombia's economic and social gains. 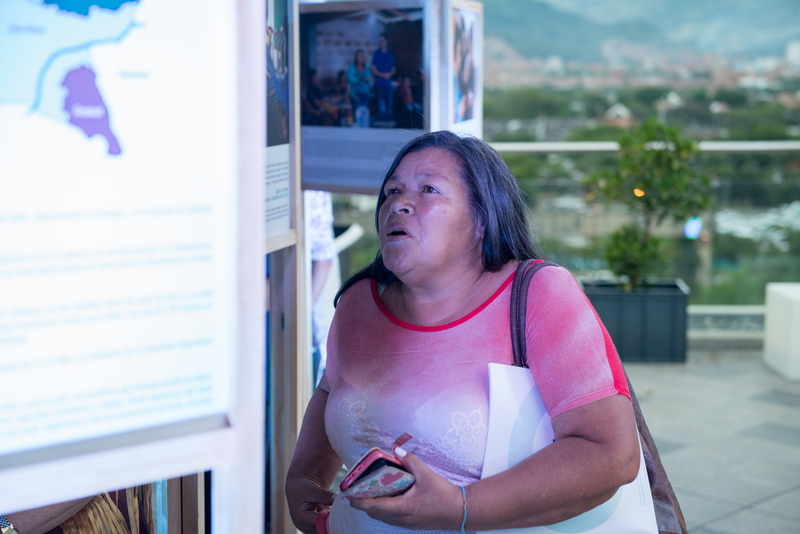 Earlier this month, with our partner, the University of Antioquia's School of Medicine, we hosted a photo exhibit and panel discussion, Caras de Granizal (Faces of Granizal) that focused on health, displacement, and diplomacy through the perspective of the Granizal community, Colombia's second largest community of internally displaced persons and also one of its poorest. Through the event at the Modern Museum of Art of Medellin, we hoped to provide a public forum and platform for community members to share their stories about their journey to peace, while providing an opportunity to connect viewers to the community by showcasing the values and hopes that are common to us all: good health, safe neighborhoods, participation in political processes, and opportunity. Convening members of multilateral organizations, regional and local governments, academia, private and nonprofit sectors, and the media, we hoped to build solidarity among these various entities to bring about long-term commitment in ensuring Granizal and communities like it receive the public benefits, protection, and opportunities they are entitled to as Colombian citizens. Our panelists included Victor de Currea Lugo, a doctor, professor and journalist known for his work on human rights and armed conflict, and Carlos Ivan Lopera, Regional Coordinator for the United Nations Development Program. As Dr. Lugo shared, "Peace is just the beginning. Ensuring the viability of the Peace Agreements will call for the active participation of all Colombians. Empowering citizens to be active participants in their society will require good health. As doctors then, we play an important role in enabling civic participation. Health, in many ways, can be seen as more than a fundamental human right, but a political one as well." In addition to Caras de Granizal, another outcome of our Post-Conflict Colombia and Public Health Project included the expansion of the community center in Altos de Oriente, which serves as a health clinic, learning center, internet café, and a recreational space for children. Finally, as a result of the January collaboration, several other seeds have been planted for cross-cultural cooperation, including an inter-institutional effort in census mapping of the region, as well as one of our American fellows, Katrina Keegan, spending her 2016 summer in Medellin to work alongside Dr. Jaime Gomez and the Granizal community. Katrina shares, "Transformative experiences like the one I had in January are defined the people you share it with. I could not be more grateful for my Colombian colleagues, who have since become some of my dearest friends, and for my dedicated professors, who have offered invaluable support and mentorship throughout this journey. Likewise, I'm honored to be working with members of the Granizal community, whose contagious optimism and vibrant personalities shine even in the face of adversity. Such relationships serve as potent reminders that cross-cultural exchange, mutual understanding, and a shared mission are powerful agents of long-lasting positive change." Working across cultures with our friends in Colombia provides critical learning opportunities on how to better address public health issues for vulnerable populations, both in Colombia and in the United States. It also helps cultivate trusting international friendships that can help create a healthier and more prosperous world for everyone. In this period of American history, we hope that more private citizens and organizations will continue to reach out and build those connections between the United States and our friends across the globe. We have so much to learn and share with one another. Our hope for 2017 is that we all can continue to extend an open hand of friendship regardless of culture, language, religion or policy differences. For more on the Caras de Granizal exhibit or to see it in person in the United States, follow us on Facebook, Twitter, and Instagram to find out when and where it will debut. You can also subscribe to our Newsletter for the latest updates from Open Hands Initiative. 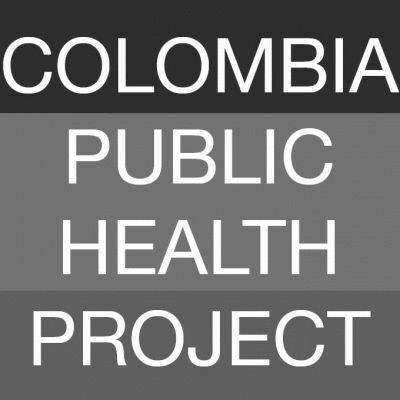 This article reflects an outcome of the "Post-Conflict Colombia and Public Health" project. The views expressed are those of the author and do not necessarily represent those of the University of Antioquia or Harvard Humanitarian Initiative. 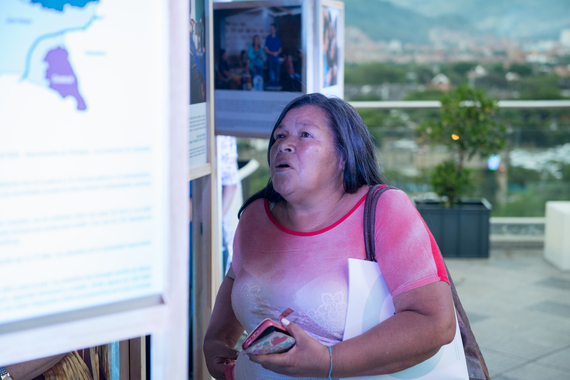 Top: Granizal community leader reflects on exhibit. 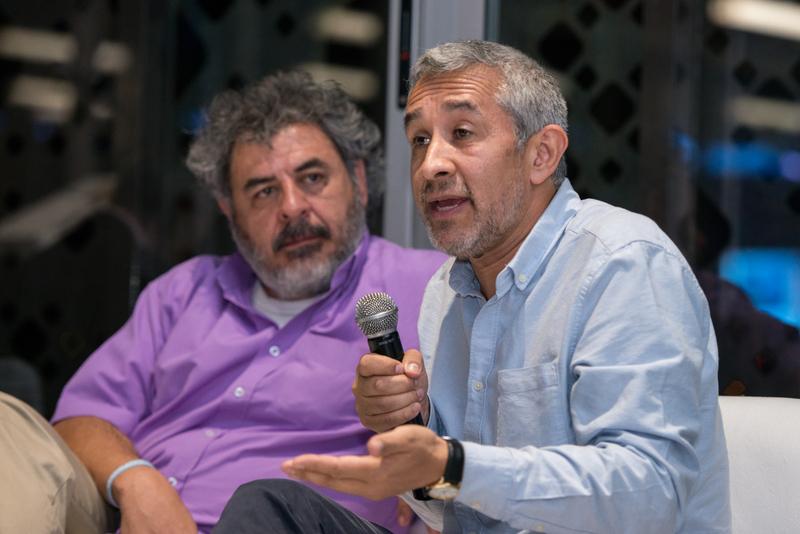 Middle: Our panelists included Carlos Ivan Lopera, Regional Coordinator for the United Nations Development Program, and Victor de Currea Lugo, a doctor, professor and journalist known for his work on human rights and armed conflict. 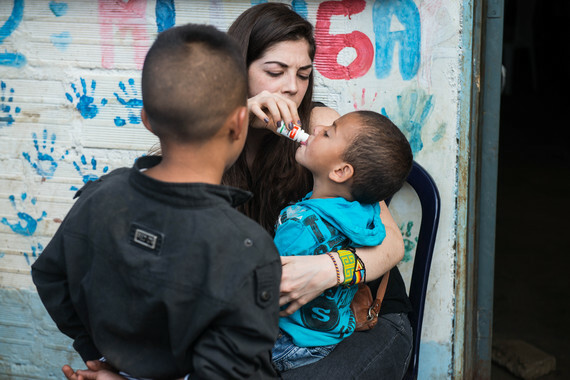 Bottom: Student Ambassador Katrina Keegan provides de-worming medication to young Granizal community members during our health fair. A project of the Open Hands Initiative and the Harvard Humanitarian Initiative, in collaboration with the University of Antioquia.